SK Telecom T1 wins 4-3! Poll: Recommend Dear vs Bisu? Your vote: Recommend Dear vs Bisu? Poll: Recommend Trap vs soO? Your vote: Recommend Trap vs soO? Poll: Recommend Last vs Sacsri? Your vote: Recommend Last vs Sacsri? Poll: Recommend Bogus vs Rain? Your vote: Recommend Bogus vs Rain? Poll: Recommend hyvaa vs Best? Your vote: Recommend hyvaa vs Best? Poll: Recommend Classic vs Fantasy? Your vote: Recommend Classic vs Fantasy? Your vote: Recommend ACE match? if anyone wants to make a custom banner It's welcome btw, just PM me with it or post it here. rain vs. bogus hype match inc! STX should take this fairly easily if it does not go to game 6. STX HWAITING!!! The best KeSPA players according to GSL Bogus and Rain will clash vs each other in the best match of the 1st Week!!! 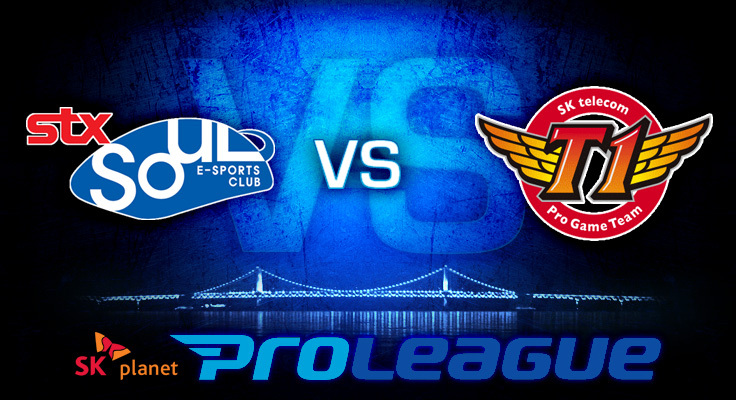 LOL Look at the result of the preseason match between these 2 teams, SKT won easily. It should be possible to get the Korean vods for free, not sure about the English stream. Korean vods is fine, even better in fact! Gotta love that enthusiasm! EDIT: GO Skt! Especially Fantasy and Bisuuuuuuu! happy birthday, and I have full confidence in what I said. you'll see it when trap beats soO. Gonna be good, thanks for the OP. 4:2 for STX. Or wouldn't they play all matches? Then 4:0. IIRC they stop after it's decided... although wouldn't it be better for the fans and the ranking to play all games? That would be interesting indeed. I still think SKT wins confidently. no its a waste of time, no point in playing matches unnecessarily. Crossing fingers for Bisu... hope he stepped up his game. Fantasy will own as always.